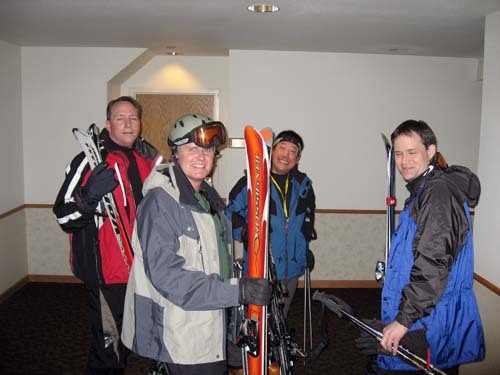 On 4/2/08 (Wednesday) - 4/6/08 (Sunday) several of us met in Breckenridge, Colorado to go skiing. Here is who showed up: Me (Brian Wilson), Mike Chow, Paul Wieneke, Brady Nilsen, Garth Eliason, and Brian Wohletz. Below are some pictures from the trip. Click on any picture to get a HUGE version of that photo. This trip (with this group of friends) is an annual trip we have taken for 10 years. Each year we decide a new location and all meet there. Here is the list of locations and the dates we skied there. 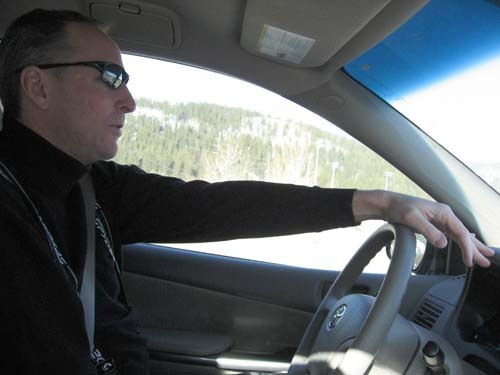 4/2/08 - Breckenridge, Colorado (The web page you are reading). 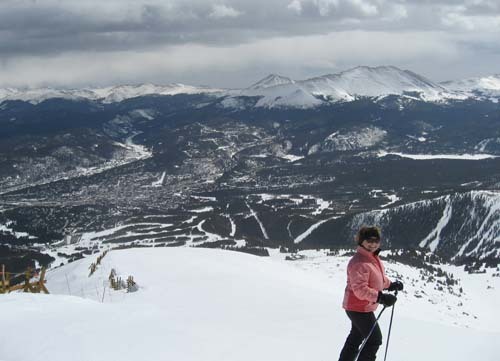 Ok, on to this year's ski destination-> Breckenridge! 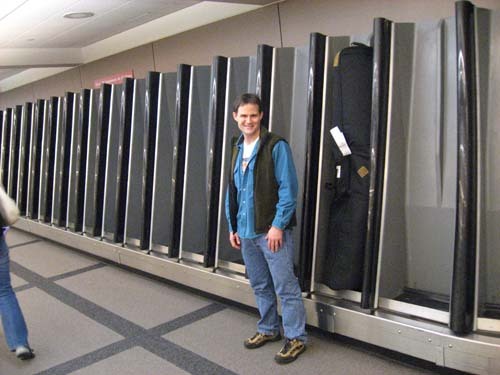 Below is Brady standing in Denver International Airport (DEN or sometimes called DIA) in front of the special "ski" baggage claim system. 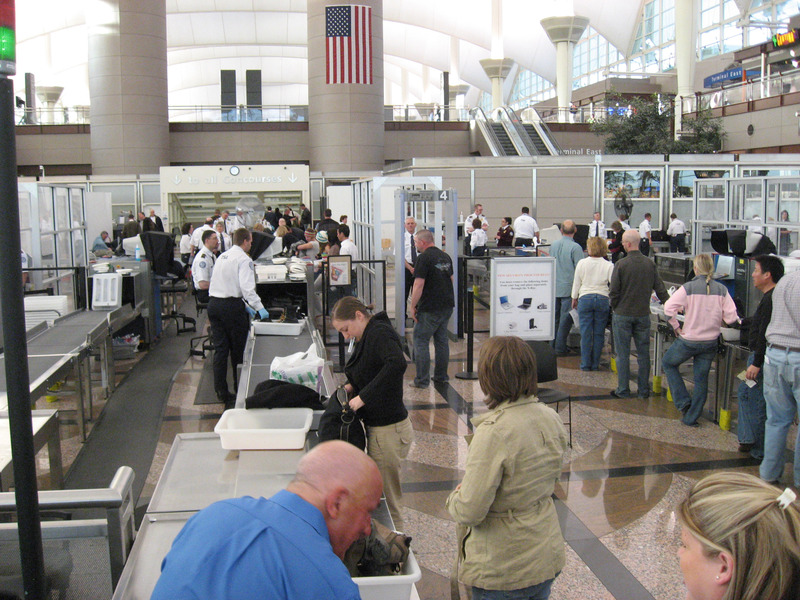 Denver is setup for destination ski vacations. This was taken on 4/2/08, Wednesday night. The next morning (4/3/08, Thursday) I came down with a cold and decided not to go skiing, but the rest of our crowd that was there went skiing. Below is the picture as they leave the condo to ski Breckenridge (across the street from our condo). 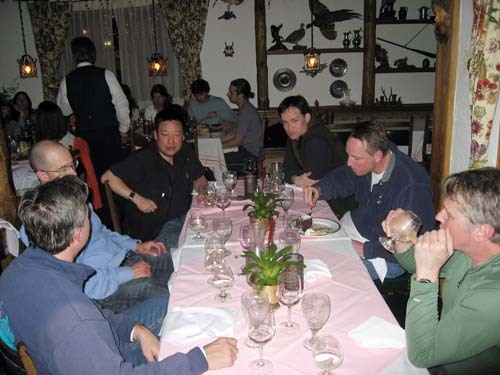 From left to right that is Brian Wohletz in the red jacket, Paul Wieneke in front, Mike Chow mugging for the camera in back, and Brady with his eyes closed because of the camera flash on the far right. The next morning (4/4/08, Friday) the weather looks spectacular at sunrise (see picture below from out our condo deck window). We decide to take the 45 minute drive to Vail to ski. This picture below is taken facing backwards in the Van. 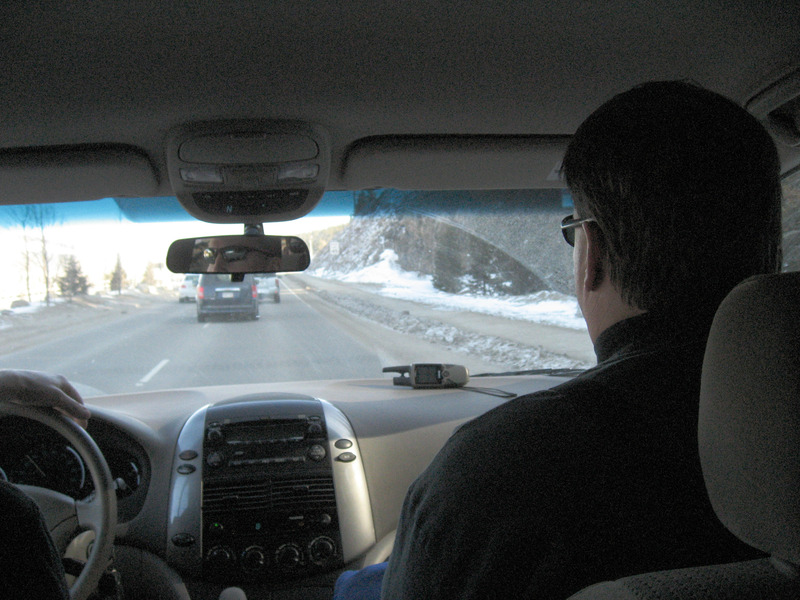 In the far back seat is Garth Eliason. Mike took this picture looking forward, that's the back of my head (Brian Wilson). Brian Wohletz driving to Vail, Colorado. 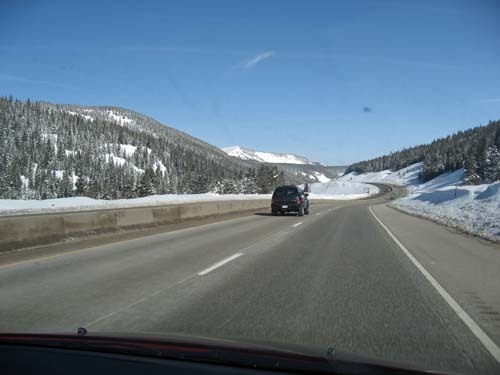 The day is gorgeous, here we are driving down Colorado State Highway I-70 between Frisco and Vail. 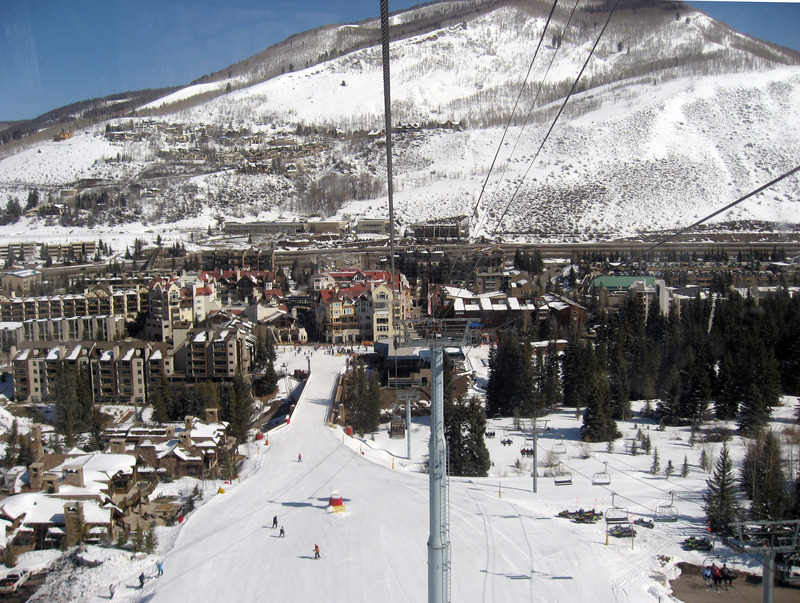 First gondola ride up from Lion's Head Base area, Vail, Colorado. 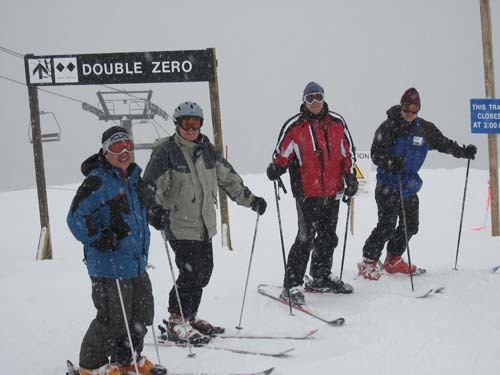 We got a stranger to take this picture of our whole crowd at the top of Vail. Zoomed in, from left to right that is Mike Chow, Garth Eliason, Brian Wohletz, Paul Wieneke, me (Brian Wilson), and Brady Nilsen. 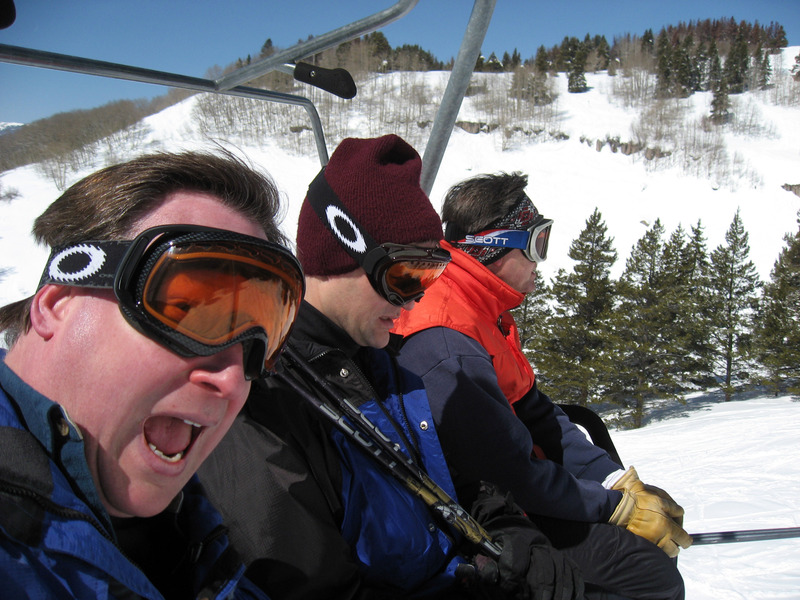 An action shot I took on the lift by holding the camera away and pointing it back at the three of us. That's me (Brian Wilson) being silly, Brady in the middle, and Garth at the end in red. Riding a chair in the Vail backbowls. Use your horizontal scrollbar to see the entire panorama below (CLICK ON IT for a much larger version!) This is one of the famous "Vail Back Bowls", on a great day of sunshine and PLENTY of snow. 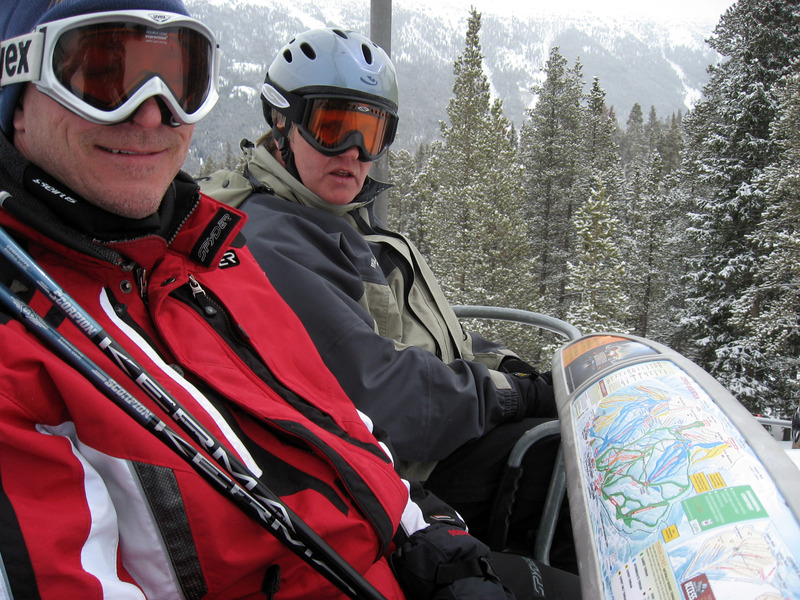 Here we are riding a Poma lift, which is a system that drags you along the snow so you don't have to walk. That's Garth Eliason behind me smiling into the camera. 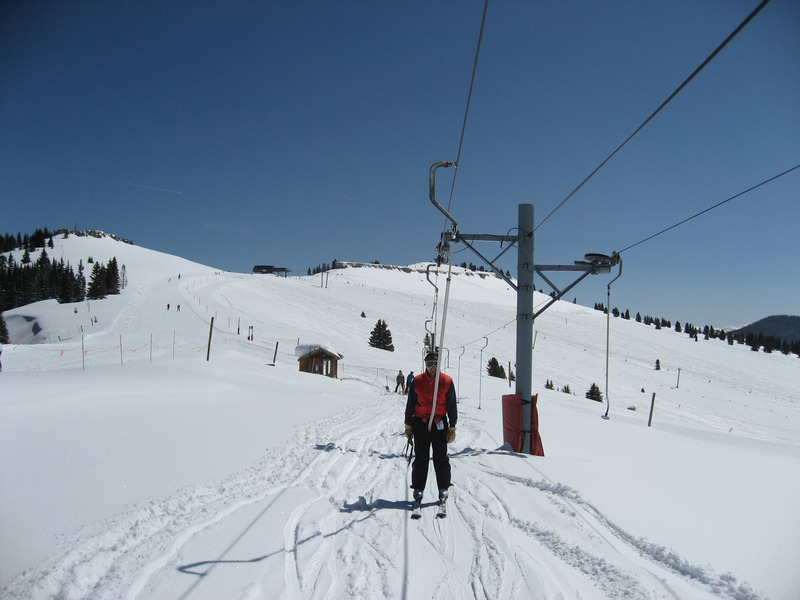 Facing forwards on the Poma lift. We stopped for lunch in "Two Elk Lodge" at the top of Vail. This famous lodge was burned to the ground in 1988 by wacky environmental groups. For a couple years a temporary structure was here. 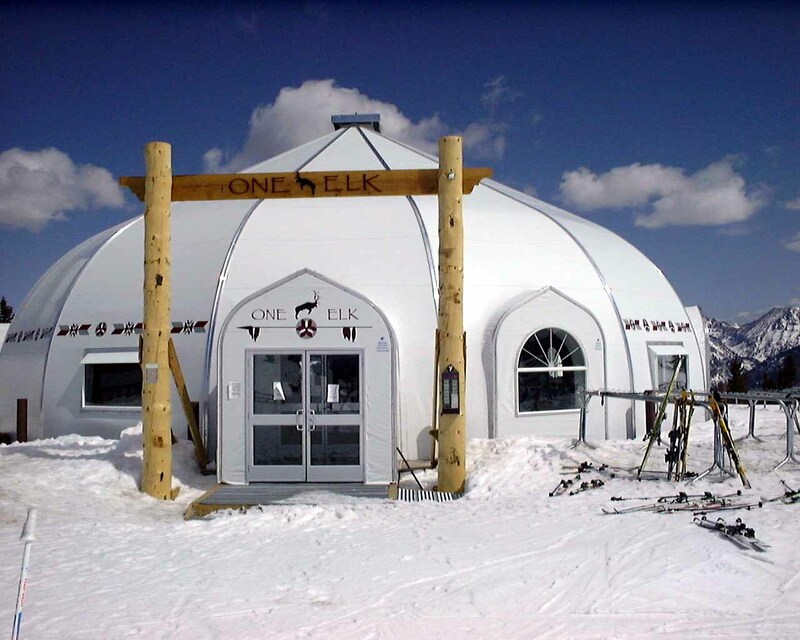 Click Here to see pictures from 1999 when I had lunch in that temporary structure that Vail jokingly called "One Elk". 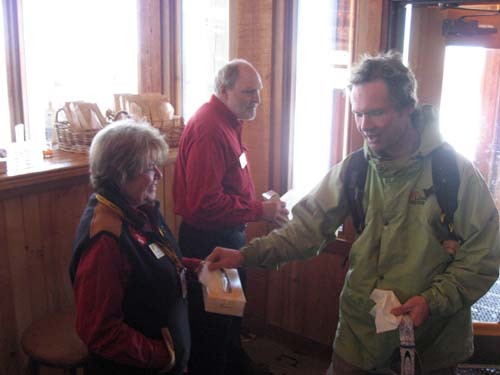 Below are two greeters handing out tissue to skiers. Vail just does an OUTSTANDING JOB of delivering on every little detail. 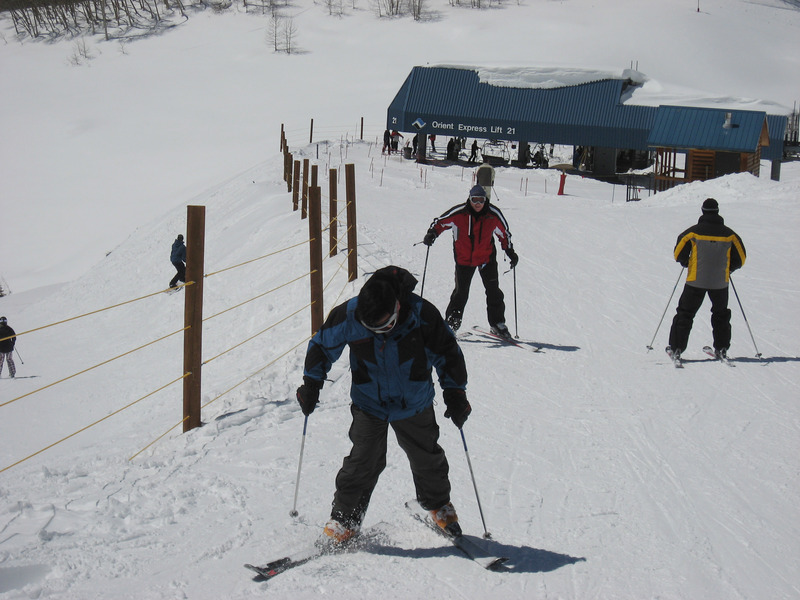 Click here and search for "Two Elks" to see a write up I did last year about the quality of Vail. The interior of "Two Elk Lodge" at the top of Vail, Colorado ski area. 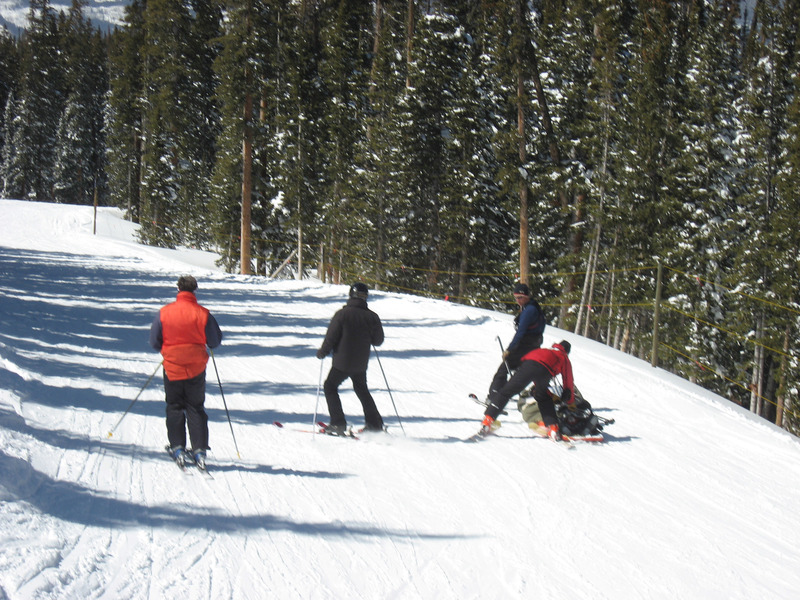 Skiing is a spectacularly dangerous hobby. A snowboarder died at Aspen the day before this picture was taken. Below is one injured skier getting taken down the mountain by ski patrol in a sled. Click here for a web page explaining the sled ride that I wrote when my friend Paige was injured at Taos New Mexico on the ski slope (that was written a few years ago). 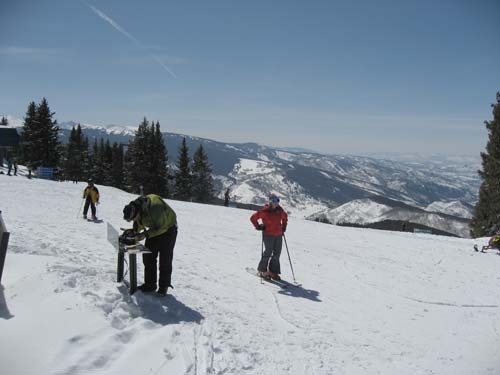 Below is a picture of an injured skier at Vail. A random picture from the top of Vail showing the nice weather and mountains in the distance. At the bottom of Orient Express, a few of our group missed the turn and had to hike back up a few yards. We're headed back to the new Vail lifts (expanded just recently) called "Blue Sky Basin". 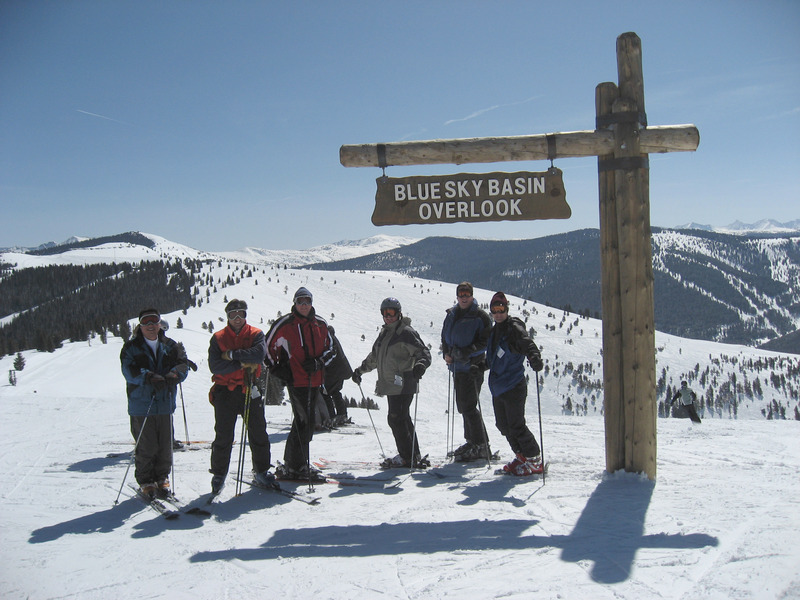 Here is our group at the "Lion's Head Base Area" at the end of a fabulous day of Vail skiing, big BIG sunshine, and plenty of snow. From left to right that's Garth, Paul, Brian Wohletz, Mike Chow, and Brady Nilsen on the far right. Same spot, just showing the ski slope behind Brady. This picture was taken about 4pm as the ski area closed. 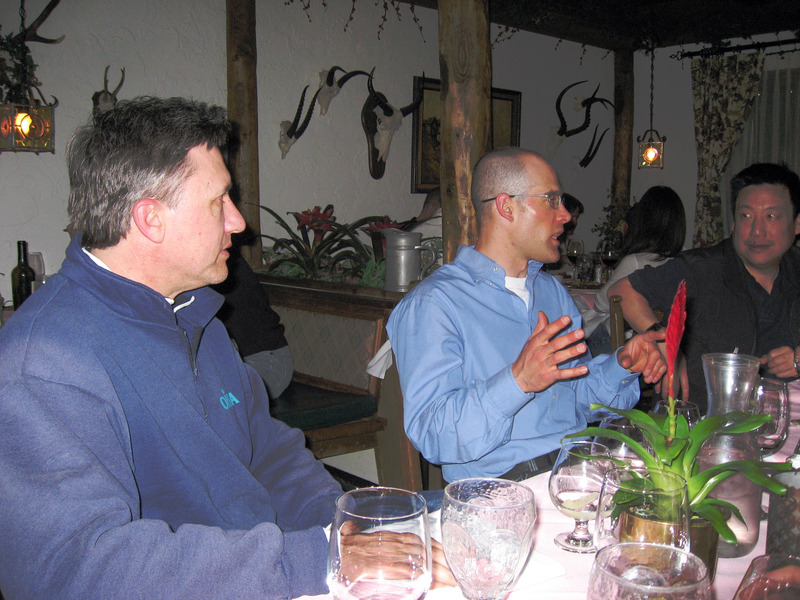 That night we had dinner at Pepi's in Vail Village with Karl Hoechtl. Karl grew up in Vail, his father is one of the earliest ski instructors at Vail. 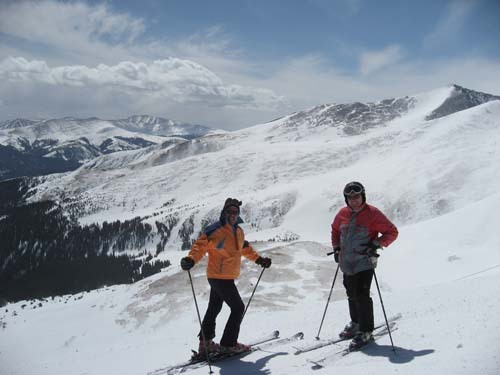 We met Karl through Garth, and we skied with Karl 11 years ago for the first time in 1997 here at Vail. Garth on the left, and Karl Hoechtl in the middle in the blue shirt. 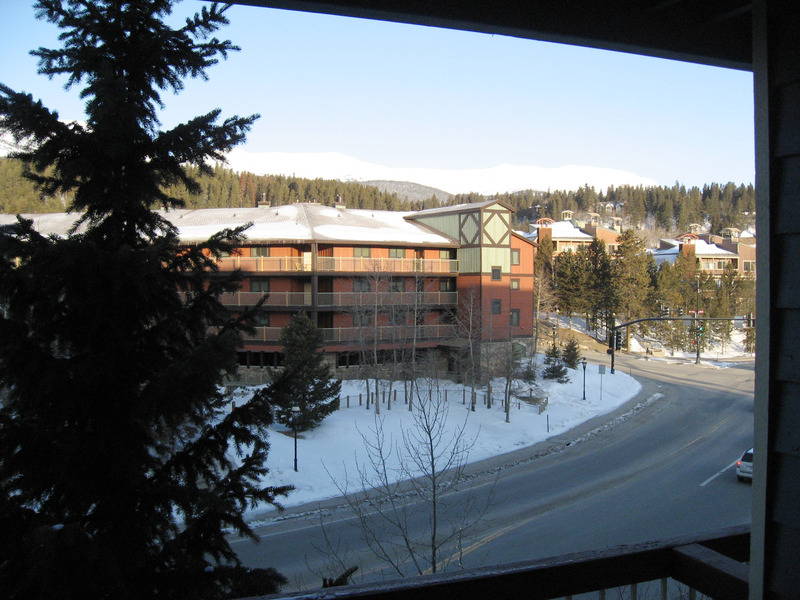 The next morning (4/508, Saturday) we skied Breckenridge, Colorado. It was a neat day for me, because I met up with a friend I had not seen in 17 years, Michele Hirsch. Michele and I were lab partners in computer science classes at Stanford in 1991. 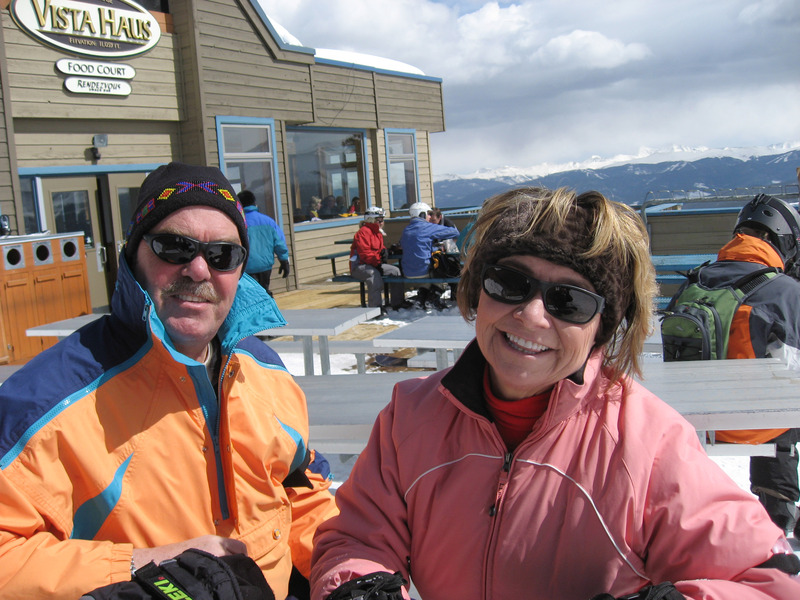 Below is Russ (Michele's husband) and Michele sitting outside at Vista Haus mid-mountain lodge in Breckenridge, Colorado. Breckenridge has a lift that goes up to 12,840 feet (3,914 meters) called "Imperial Lift". 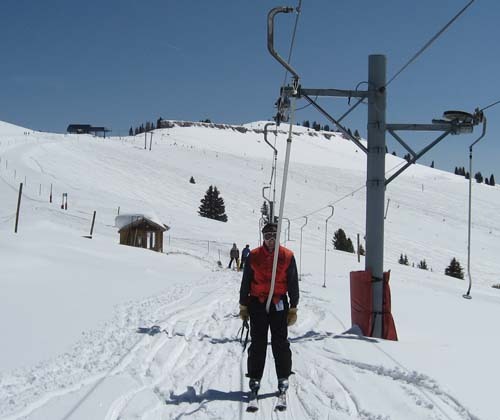 This is the highest lift in North America, so I wanted to get a picture of myself at the top. 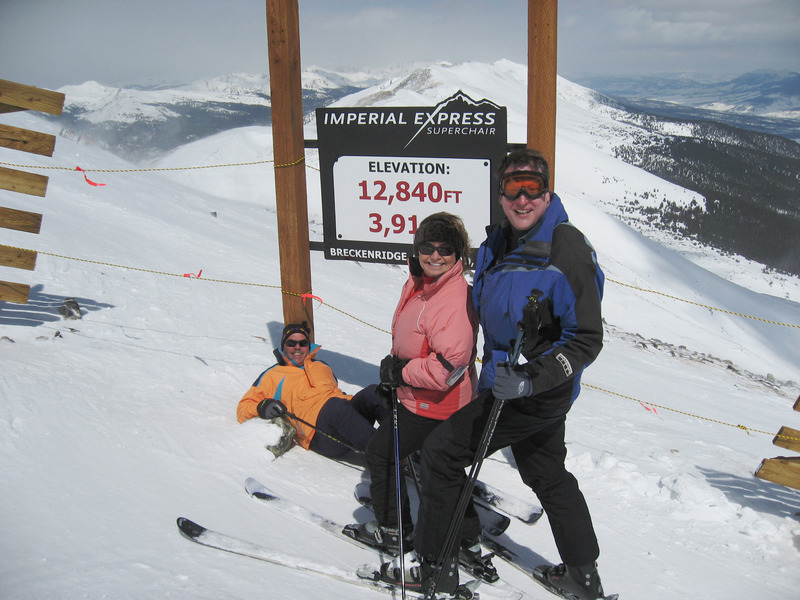 :-) That's Russ in orange lying in the snow, Michele in Pink, and me in blue. 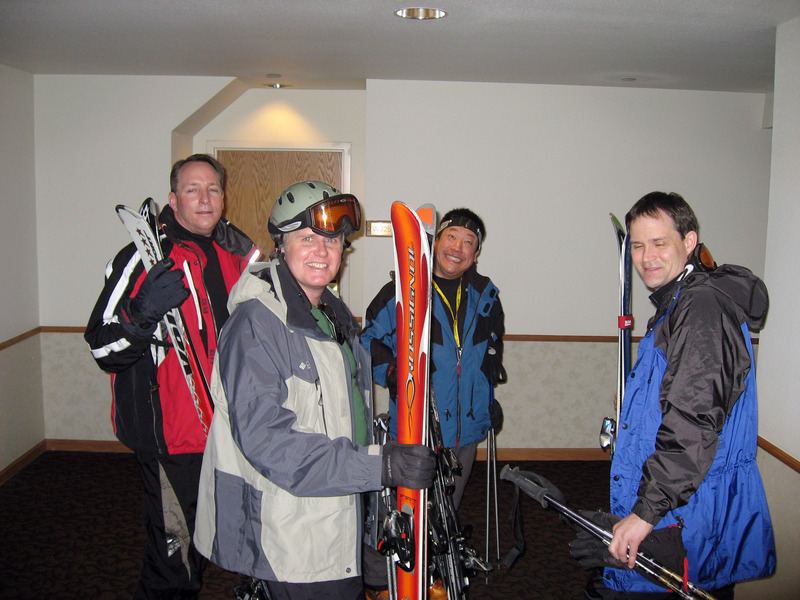 We met a skied with Herbie, pictured below on the right. That's Russ on the left. 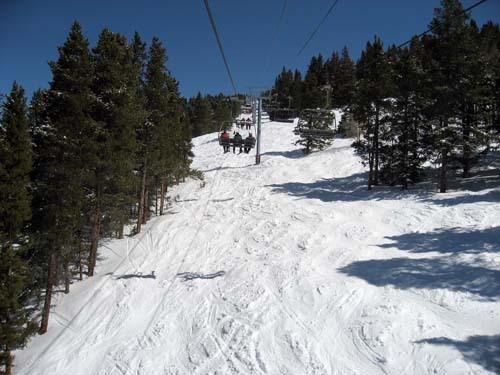 What a beautiful day at Breckenridge! Michele, with the town of Breckenridge way down below. 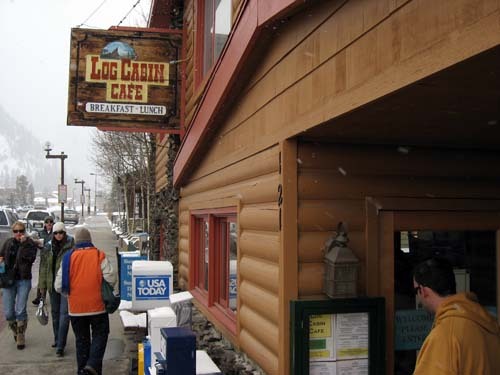 The next morning (4/6/08, Sunday) was our last day, but the weather was kind of cloudy and overcast and didn't look great, so we took our time checking out of the condo and headed to Frisco (small town near highway 70) and the "Log Cabin Cafe" for a leisurely breakfast before going skiing. Because the weather wasn't great, we skied only a half-day at Copper Mountain. Here we are riding up the lift. That's Brian Wohletz on the left, and Paul Wieneke at the end. 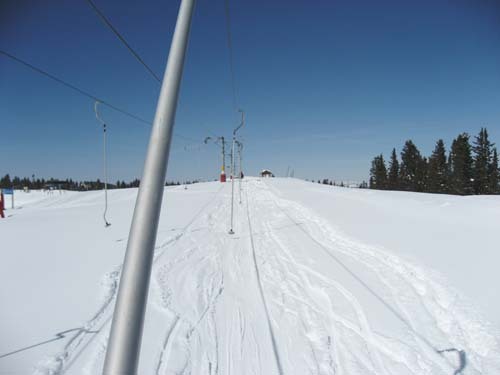 Notice the LIFT MAP that is attached to the ski lift (lower right of the picture). 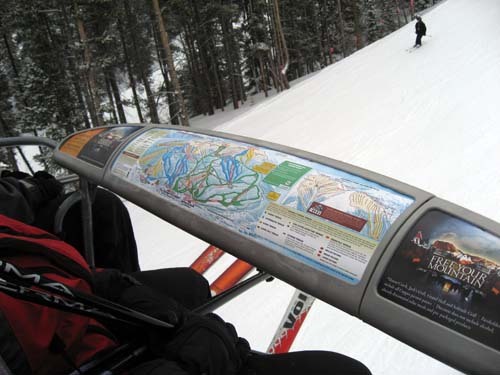 This is a great idea, it allows us to look at the map of the mountain while riding the lift. A close up of the lift map attached to the chair lift at Copper Mountain Ski Area. Click on the picture below to zoom in to a HUGE close up version. You can tell the day is overcast from this picture. 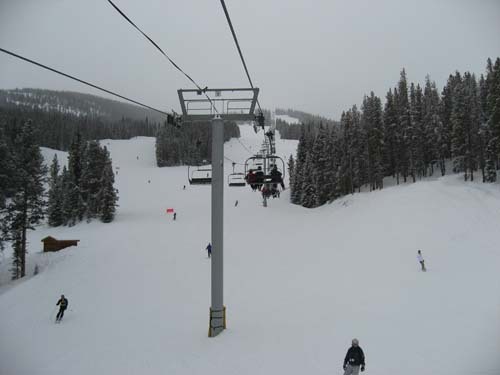 There is actually about 6 inches of fresh snow, but it's "heavy", not that great to ski on. 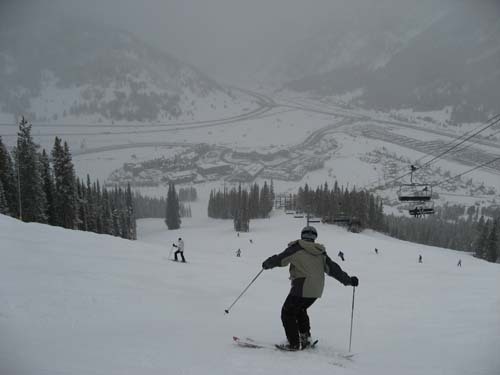 A picture of the base of Copper Mountain Ski Area, from the ski slope. 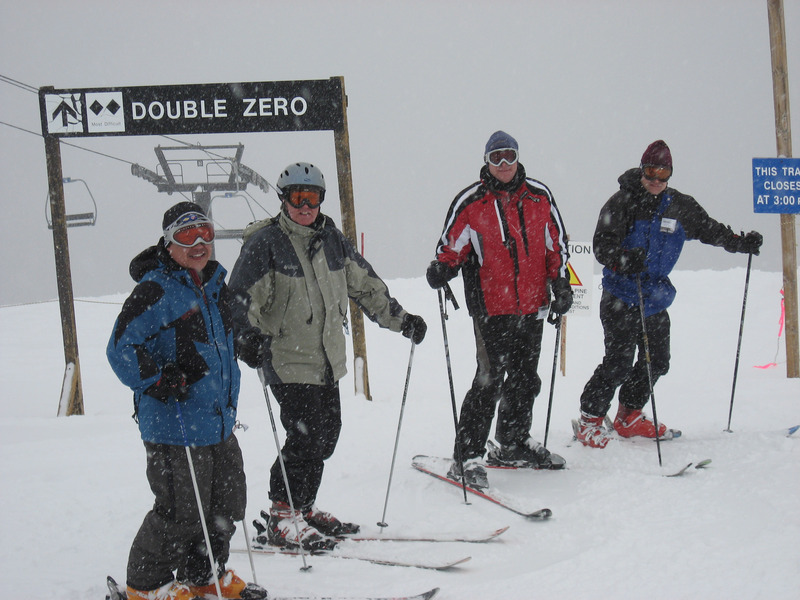 We skied this double-black ski run called "Double-Zero" at Copper Mountain, here are Mike, Paul, Brian Wohletz, and Brady posing at the entrance. 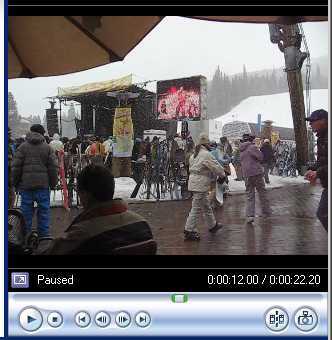 At the end of the day at the bottom of Copper Mountain they had a few party bands. I'm SURE the organizers thought it would be all sunshine and warm, and almost no snow, but it was cold, wet, and snowing. :-) Below is a picture of the base area party. The following is a very movie of the base area party (if you are interested in the music and scene and such). To get a higher quality version FOR WINDOWS ONLY, click here. The link below takes you to to a YouTube version for maximum compatibility and lower bandwidth. If you are on a Macintosh and want to watch the Windows Media Format high quality version, install this free product first: "http://www.flip4mac.com/wmv.htm". 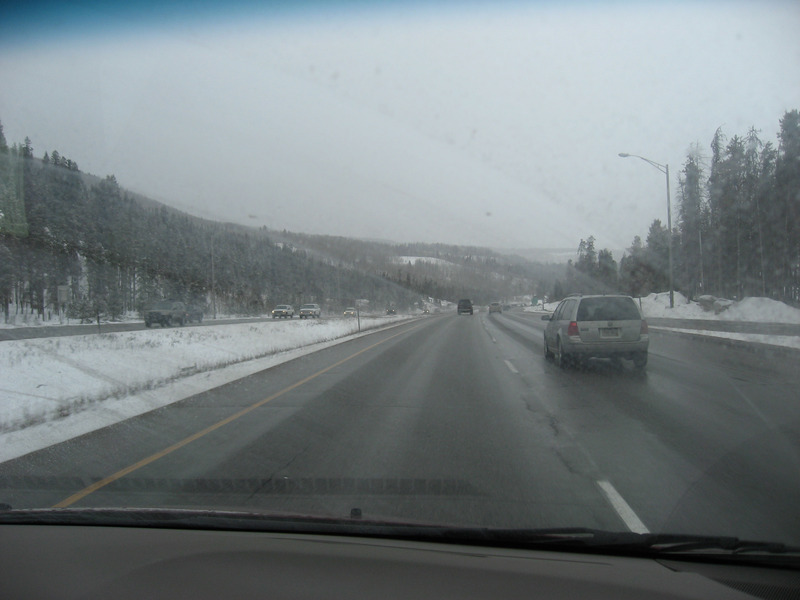 Time to head for home, here we are driving East on Colorado I-70 towards Denver. Denver International Airport security. They do a pretty good job of having lots of lanes open, keep people moving. And that's it! Thanks for stopping by this webpage! If you have any corrections or feedback, please email me at the email address below.